This isn't me shutting down and giving up on the Running Man of Tech column. But it is me realising that something is really wrong with wearables. Something happened to me on a recent recovery run in Hyde Park, and it irritated me to the point I deleted this week's piece to write about it. I was trying out Moov's 'Running Efficiency' setup (Moov being an ankle strap that monitors your stride for things like impact, lean, stride length etc.) when I was consumed with anger. Not at the Moov system itself, which is more than half-decent, but at the fact fitness tech fans are being short changed. The app was telling me to shift my weight about a bit to get a better stride, when I was sure that I had – and I started wondering if it would be better if there were more sensors in the soles of my shoes. And that's when the fury lit, the straw that broke my CamelBak. Regular readers will remember when I outlined one of my favourite bits of technology, the Nike Lunar TR1+ training system, from way back in 2010. These had just those sensors, four placed around the sole that could monitor footfall or check on how you're performing a circuit workout. Five years ago. Half a decade. The reason this was the tipping point was it was the second time in a week I was stymied in my attempts to improve running through tech thanks to not being able to use one service with another. I've been trying out SmashRun, the service that has more stats in it than anything I've ever seen. Like most runners, I love to pore over training results, see where I'm doing better or worse, and try to use that science to get better. Except it can't work with all services, some providers giving better access to their runner's personal stats than others. I've been using the Adidas SmartRun instead of my Garmin lately, to make use of its training plans, and I now have to run with both watches if I want my data to be shown on this awesome portal. Therein lies the problem. I'm constantly having to make sacrifices to use wearable tech to improve my fitness, and it's maddening. First world problems? Of course. But it's horrendous when you realise the only thing blocking an awesome system is brands creating walled gardens to draw in users. These came out in 2010. They'd be amazing today, so what's going on? Strava won't sync to SmashRun unless I export GPX files. Garmin can't support imported training plans. Moov's sensors don't have GPS inside, relying on the smartphone. My Bluetooth headphones don't properly work with Spotify. In-ear heartrate headphones are only compatible with certain apps. The Apple Watch only really wants you to use its own workout app. Microsoft's Kinect is the best motion tracking system by far for keeping your form correct and helping you stay injury free – but you can't lug a motion sensing camera around with you on a run. You could literally spend thousands and thousands of pounds on assorted wearables, and still have to spend an afternoon workshopping with the A-Team to work out how to get an optimum fitness program going. I know business sense is the overriding factor here. Make a device, at a price you're happy with, market the hell out of it and hope that the USP you've come up with is enough to attract others. If it sells, great. If it flops, then it's your fault. But the issue is I'm constantly being told that this, THIS wearable or platform is the one to make you fitter, shinier and that much closer to qualifying for the Olympics, when in reality they're miles away from being the awesome system that could be created: a personal trainer that can see inside your body as you run. Wouldn't it be great to have something that tracks your speed, cadence, impact, balance and heart rate precisely and can tell you how to perfect your form to keep you injury-free yet still getting faster. One that knows what your goal is and can work out the best plan to get you there, alerting you when you need to run, for how long and exactly how far – and when it's time for you to rest, down to the nearest minute. A system that's spent so long running with you that it knows precisely the music to play to keep you going, no matter the run, keeping you at peak performance. It sounds brilliant, the future of running and wearables and technology. Something we might be lucky to get within the next decade – the runner of 2025 at a push. Except every single thing I outlined above already exists. I've tried gadgets that can track every part of my running in isolation, and yet together could build an amazing 3D picture of my form, one that any personal trainer would kill to see. 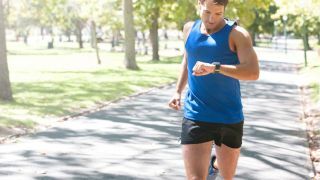 I've got apps with brilliantly specific plans to get you faster but they don't have any idea on whether they're tiring you out – and yet I've got watches that can monitor your heart rate hourly and could give precisely that info. Spotify knows my music habits and is constantly banging on about how it's tailoring music to me – it's even opened up Spotify Running as there's such an appetite to use the app during fitness – but won't share that data with apps to coordinate a playlist that reacts dynamically to my speed or fatigue. Google Fit and Apple's HealthKit aren't enough to bind these things together. Like the connected home, it's never going to take off until there's an open standard everything is based on, and given how nascent fitness tech is now, that's not going to happen any time soon. There are some glimmers of hope though, as some connections are being forged between apps so my exercise data and weight (from Wi-Fi connected scales) is shared with my food diary without any effort from me. Some apps can auto-upload to Strava, which is brilliant and painless for me. Some might ask if we need such a complex and expensive system - no, we don't. It would be expensive, but the thing is it doesn't need to be complex, it should be simple once a streamlined hub (the phone, which we all have) becomes the engine for the whole system. So every time I'm pitched a new brilliant wearable that's going to change fitness as we know it, I'm going to judge the company that made it for being part of the problem, not the solution. All I'm asking for is a smart shirt with thirteen sensors, a gadget on each arm and ankle to monitor movement, headphones connected to every song in the world, sleek smart glasses with a heads up display and shoes that can sense every tweak and turn… that's not so crazy, right? If you've got any tips, tech you want tested out or just want to mock me, I'm @superbeav on Twitter, and you can see my stumblings on Strava too.